The Celtics were a team lacking in the department of big men, with just one center under contract for next season (Fab Melo) before the NBA draft. 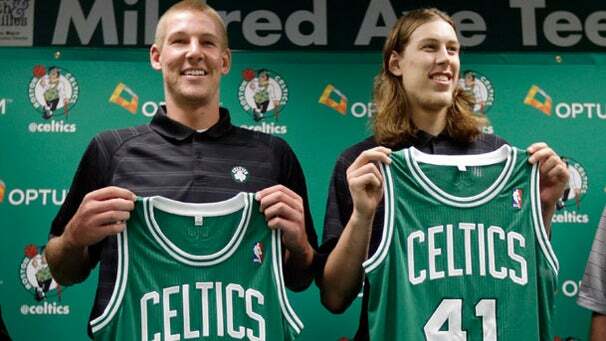 But Boston used this year’s draft to try and shore up its size issues by acquiring 7-footers in Kelly Olynyk from Gonzaga and Colton Iverson from Colorado State. But Olynyk and Iverson, who were introduced at a press conference in Boston Monday, are joining a Celtics’ team in flux, one that is currently without a head coach and one that will also be without a pair of icons, Kevin Garnett and Paul Pierce. Iverson, whom the Celtics acquired through a trade after he was selected by Indiana in the second round with the No. 53 overall pick, shared similar remarks about the situation, which won’t be official until July 12 when Kris Joseph, one of the Brooklyn Nets players who will be coming to Boston in the blockbuster deal, is eligible to be traded. No matter. Even with the Celtics’ future uncertain, they at least know they have more size. Olynyk, a 7-foot, 234-pound junior, averaged 18.1 points, 7.3 rebounds, 1.7 assists, and 1.1 steals over 26.5 minutes in 31 games for the Bulldogs last season. Celtics president of basketball operations Danny Ainge said he believes Olynyk, who will wear No. 41, will play more power forward than center in the NBA. “We think he can be a 260-pound, 7-foot guy and be a great, well-conditioned player that can play some center as well, especially as small as the league has gotten, Ainge said, “and to have a guy that can play the (power forward) and (center) and step outside and shoot the 3-ball and make passes from the perimeter and a great complimentary player. Iverson, who will wear No. 37, is a 7-foot, 255-pound center who transferred to play at Colorado State last season. He sat out 2011-12 after leaving the University of Minnesota after three seasons. Iverson, who is 24, averaged 14.2 points and 9.8 rebounds last season. Both players will be headed with the Celtics to Orlando for Summer League, which begins July 7.